We are celebrating the sport of skiing. We are going back to it's origins, a time of adventurous souls on minimal equipment. Legend has it , my Father lost a stripe while serving in the second world war as a flight instructor, something about a low fly in a no fly zone. He flew His Tiger Moth too close to town and dipped his wing for my mother to see (he broke the rules). Hats off to them and all the other Guys and Gals that dip their wing, Somersault , Back Flip and Zudnik to catch the eye of the one they Love. We're celebrating the golden age of Skiing and Romance! They can be hung any which way up, and work well like any good composition should! 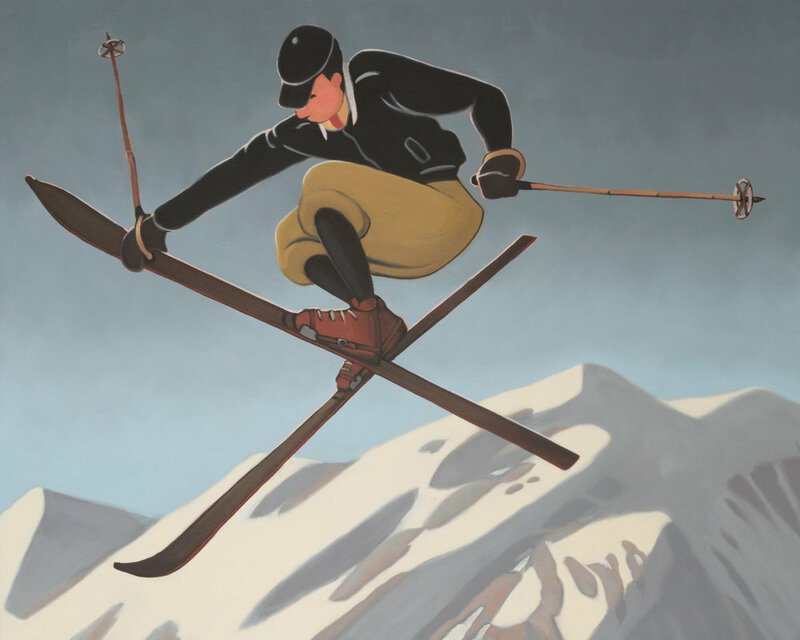 All of these paintings borrow colour, characters and tone from vintage Ski posters from the Thirties and Forties. and are all laid over images of Modern day Free Style Skiers taken from the World Wide Web. Luckily , as with Love, there are no rules in Art.